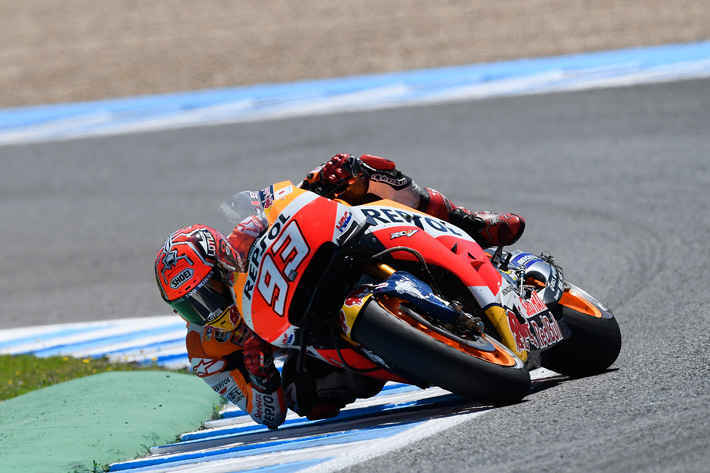 Marc Marquez (Repsol Honda RC213V) fought a valiant fight to take third place in this afternoon’s Spanish Grand Prix and maintain his points lead in the 2016 MotoGP World Championship. Team-mate Dani Pedrosa (Repsol Honda RC213V) finished one place further back in fourth after a strong ride from seventh on the grid. Twenty-three-year-old Spaniard Marquez harried second-placed Jorge Lorenzo (Yamaha) for much of the grueling 27-lap race, until he suffered a few slides in the later stages which convinced him that today discretion would be the better part of valor, so he eased off to conserve third place and his title advantage. The 2013 and 2014 MotoGP World Champion – who recently won dominant victories in Argentina and America – is not only the sole rider in the current championship top three to have finished on the podium at all four races so far he is also the only one of the top three to have finished all four races. With four races completed and 14 remaining, he leads the title chase by 17 points from reigning World Champion Lorenzo. All riders struggled with grip problems today, which was significantly warmer than both practice days. Many riders complained of a lack of straight-line traction that caused wheelspin, even in fourth, fifth and sixth gears. Pedrosa rode a storming race from the third row of the rid, briefly getting ahead of Marquez on the first lap and later successfully fending off a determined Aleix Espargaro (Suzuki). At the finish he was just over three seconds away from joining the podium party. The result lifts the former Jerez winner to fourth overall, a few points behind today’s race winner Valentino Rossi (Yamaha). Throughout practice the 30-year-old had struggled to extract the maximum from his bike/tire combination but when it mattered most he controlled the tire situation better than most. Throughout this weekend the fastest three riders – Rossi, Lorenzo and Marquez – had been well clear of the rest of the pack, but lap times were much closer further down the order. Cal Crutchlow (LCR Honda RC213V) expected a close race and he got it but he had expected to be closer to the front. The Briton spent most of the race battling in a group that comprised five or six riders. He took the flag in 11th position, less than six seconds behind eighth-place man Pol Espargaro (Yamaha). Team-mates Jack Miller (EG 0,0 Marc VDS Honda RC213V) and Tito Rabat (EG 0,0 Marc VDS Honda RC213V) finished 17th and 18th, separated by less than four seconds. Miller’s result was a confidence booster, because he missed the last race after badly aggravating a nasty ankle injury, sustained in winter training. Former Moto2 World Champion Rabat – this year’s sole MotoGP rookie – continues his acclimatization to a 250 horsepower MotoGP bike, which produces approximately twice as much power as the Moto2 machine he has ridden in recent seasons. Sam Lowes (Federal Oil Gresini Moto2 Kalex) rode to a faultless victory in the Moto2 race, defeating a persistent threat from last year’s winner Jonas Folger (Dynavolt Intact GP Kalex) who in turn shook off a dogged effort from third-place finisher Alex Rins (Paginas Amarillas HP 40 Kalex). Folger led from the start but on the second lap he ran wide at the Dry Sack hairpin, where Lowes leapt into the lead, never to be headed. Folger kept up a relentlessly tough pursuit, but the Briton was perfect on his CBR600RR-powered Kalex and never allowed the German to get close enough to counter-attack. And yet it took Lowes until lap 19 of 26 to open a full one-second advantage, which he steadily increased in the final laps as Folger opted to accept second. Lowes crossed the finish line 2.4 seconds ahead for his first win since Austin last year, a success that increased his championship advantage to ten points over Rins, who finished this race more than five seconds behind Folger after a challenging two days of practice. Franco Morbidelli (Estrella Galicia 0.0 Marc VDS Kalex) took fourth place after his long duel with Lorenzo Baldassarri (Forward Team Kalex) ended on the last lap when Baldassarri fell. The Italian teenager remounted to finish just outside the points. Reigning World Champion Johann Zarco (Ajo Motorsport Kalex) recovered superbly from what had been a difficult weekend to take fifth place, after charging through from 16th on the first lap. His last victim was Qatar GP winner Thomas Luthi (Garage Plus Interwetten Kalex), who beat Takaaki Nakagami (Idemitsu Honda Team Asia Kalex) by less than four tenths of a second. Dominique Aegerter (CarXpert Interwetten Kalex) finished eighth, Luis Salom (SAG Team Kalex) ninth and Xavier Simeon (QMMF Racing Team Speed Up) tenth. Simeon was the top finisher not riding a German-made Kalex chassis – he uses an Italian-made Speed Up chassis. Today’s opening Moto3 race was an epic encounter, with Jorge Navarro (Estrella Galicia 0,0 Honda NSF250RW) doing most of the leading while battling with rookie Nicolo Bulega (KTM) and Francesco Bagnaia (Mahindra). But what none of the leading trio had expected was a victorious attack from Brad Binder (KTM), who had to start from the very back of the grid after officials discovered that his team had mistakenly used non-homologated ECU software in qualifying. South African Binder was the first rider to win a Grand Prix from the back of the grid since Marquez won the 2012 Valencia Moto2 race from the back. Binder made astonishing progress through the pack, taking the lead for the first time from Navarro on lap 18 of 23. That left Navarro to battle for second with Bulega and Bagnaia until the final turn, which they took three abreast. Navarro did his very best but was forced into the wrong position on the corner exit and crossed the line in fourth place, just 0.072 seconds behind third-place finisher Bagnaia. It was scant reward for his sterling efforts throughout the race but the 20-year-old Spaniard retained his second place in the World Championship standings. Jakub Kornfeil (Drive M7 SIC Racing Team Honda NSF250RW) had a great ride to get to the front of a breathtaking contest for fourth pace which at one point comprised no less than ten riders. The 23-year-old Czech rider beat Joan Mir (KTM) by two tenths. Two other Honda riders were involved in the fight: Enea Bastianini (Gresini Racing Moto3 Honda NSF250RW) and Jules Danilo (Ongetta-Rivacold Honda NSF250RW), who finished eighth and ninth. Teenage rookie Khairul Idham Pawi (Honda Team Asia Honda NSF250RW), who last month in Argentina became the first Malaysian to win a motorcycle Grand Prix race, made an excellent Spanish Grand Prix debut, finishing the race in 14th place. Niccolo Antonelli (Ongetta-Rivacold Honda NSF250RW) had a very unlucky return to Europe. The 20-year old Italian had machinery issues on the grid, had to start the race from pit lane and later slid off. The MotoGP paddock’s next stop is Le Mans, for the French Grand Prix on May 8.